This chart is found on the opportunity scanner page. Cost per weighted activity unit (WAU) shows the amount spent by a trust to produce one WAU of clinical output and is the most effective way to compare overall trust productivity consistently at a high level. This chart gives a detailed overview of your trust’s cost per WAU, broken down by area. Click on a band to visit the relevant section of the Model Hospital. Each band is coloured to reflect its relative national quartile and can be compared with the national median and your selected peer group by hovering over the band. 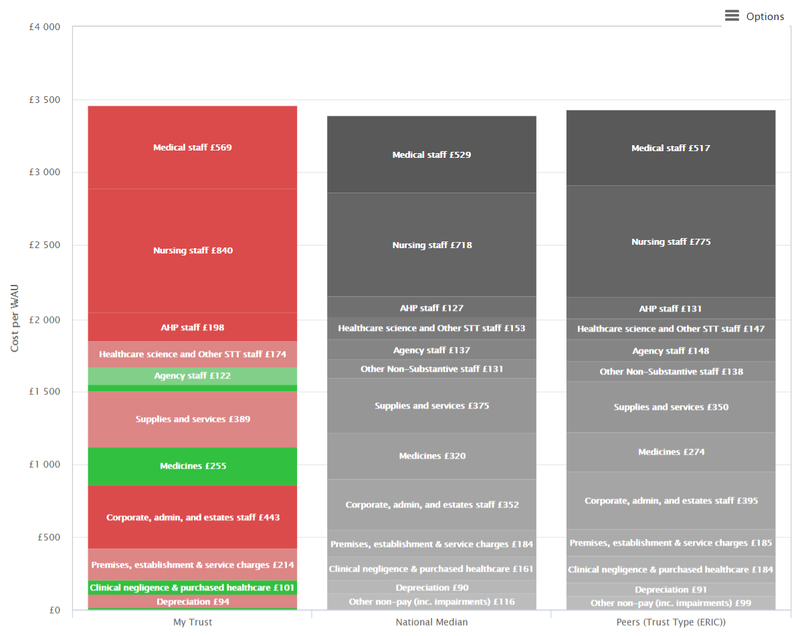 The figures in your trust’s bar, on the left, show the average amount spent by your trust to produce one unit of clinical activity (one WAU). The figures in the middle (national) and right (peers) bars are medians for each individual component of spending. This makes them useful for comparison in this view, but if we added them up they wouldn’t match the national and peer medians for cost per WAU that you’ll find elsewhere in the Model Hospital. The total of all the individual medians isn’t a helpful number for comparison, so we have not included it on this chart.